Another Holocaust book? Can I really cope with that? 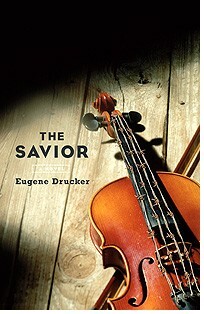 I have to confess having these thoughts upon receiving Emerson String Quartet violinist Eugene Drucker's new work of fiction: "The Savior." Is there more to say? Anything new we are ready to hear? Indeed, when one recovers from an emotional wound, a trauma of the soul, it takes time. Like a physical injury, first one stops the bleeding, stitches up the wound, protects it. At first, one can take the bandage off just for brief periods. But eventually it needs air to heal. Drucker focuses on neither extreme of the horrors perpetuated and suffered during the Holocaust; instead, Drucker exposes the man in the middle. His protagonist is neither a soldier or a prisoner, but a citizen, disgusted but paralyzed, wanting to believe nothing bad is happening while wading a tortured path straight through it. It's a thought-provoking, multi-faceted look at the darker side of human nature. Drawing on history and on the direct experiences of his father as a German Jew during World War II, Drucker explores the psychology of a German violinist, Gottfried Keller, who avoids combat due to a "bad heart" but is compelled to play for an unappreciative audience of wounded German soldiers. One day he is brought by the SS to a prison camp, where a dangerously bored and depraved Kommandant has devised an experiment: a way to give a group of prisoners hope through music. Keller must give a series of four concerts, and between them, he is left to reflect on his Jewish friend, Ernst, and his Jewish girlfriend, Marietta, who both fled Germany as Keller remained in denial. Laurie: You could have written about your life as a founding member of the Emerson String Quartet, but your chose to write a work of fiction, about a very dark subject: the Holocaust. Why? Gene: I've written a fair amount of non-fiction about music, mostly in the form of program and liner notes, and Deutsche Grammophon has often asked for personal reflections (meant to represent the feelings or views of my quartet colleagues as well as my own), which have been printed in the CD booklets or as online "Listening Guides" for the DGG website. Years ago I wrote some articles for Ovation, The Strad, Strings and Chamber Music Magazines. The quartet has already collaborated on an archival book called "Converging Lines," meant to celebrate our 25th anniversary season. I've always been interested in writing fiction, ever since I was an English major at Columbia while getting my diploma at Juilliard. It took a special effort, and years of practice, to differentiate my fiction style sufficiently from the way I write articles. Growing up as the child of a musician who emigrated from Germany in 1938, I have been fascinated by the moral dilemmas in which both Jews and non-Jews were caught as a result of the Nazis' racial policies. Laurie: Tell me about how your family history shaped this novel. How much of these were your father's stories? What did you draw on for your description of the camp? What is your own relationship with your religion; is it music? Judaism? or both? Gene: The flashbacks that take place from 1933-35 are all loosely based on my father's experiences, including the relationship with Marietta. However, it was my father, a Jew who had already auditioned successfully for the Palestine Symphony Orchestra, who decided not to follow her to Palestine, and to emigrate to the U.S. with the rest of his family. It was here that he met my mother. In the novel, the love between Gottfried and Marietta is much more complicated because of their different backgrounds; in choosing not to go with her, Gottfried chooses to remain in Germany. I dramatized his betrayal of her, mixing it with paralyzing stage fright and religious doubt, in a way that had nothing to do with my father. The "Ernst" character in the fourth chapter is more closely based on my father's personality and experiences. For my description of the camp, I drew on a fairly wide reading (over the years) of history, survivors' memoirs and some fiction. For my description of the warehouse full of plundered shoes, I looked long and hard at a famous photograph; the same is true of my attempt to describe the pit full of corpses. Music is much more my religion than Judaism. I am a secular Jew. For better or worse, I believe that from my general education I know as much about Christianity as I do about Judaism. Laurie: I am familiar with the life of a musician; it is a busy one, full of travel, pressure, interruptions. You are a member of one of the most prominent string quartets today; where did you find the time to write this book? How long did it take? Gene: The book took many years of intermittent work, and I do mean intermittent. I first got the idea in 1976, and finished the first or second draft of a novella by the summer of '77, but then I put it aside for 8 years. There was a later period of 4 years when I also did not work on it. Besides those, there were many periods of months at a time when I didn't work on it. I used to write whenever I could on tour, late at night after concerts, occasionally on airplanes or in airports, and this past year, with various editorial deadlines, I had to resume that habit. It's not easy, with the amount of time and energy, both mental and physical, that music and touring demand. Laurie: How did being a musician inform your writing? Has writing this book had any kind of effect on your playing? Gene: I think I was able to bring a specific musician's perspective to my descriptions of music. When describing the music through the point of view of my protagonist, I try to write as a performer, knowing how it feels physically and emotionally to deal with one's own struggles to achieve transcendence. When transcribing Rudi's or Grete's reactions to the music, I try to write as a listener, who would not have the same vocabulary. In the final chapter, both Gottfried and Rudi describe the same pedal-point near the end of Chaconne, using different language. Perhaps writing the book has deepened my interpretation of some of the music featured in the story, or my understanding of the relationship between the performer and his audience, but more likely it has just interfered with my practicing! Laurie: I noticed the Chaconne had a major role not only in your fictional work, but also in The Violin Maker by John Marchese, about your violin commission. And I listened to your Chaconne; it is a beautiful interpretation. Your story has a moment of religious contemplation, which reminded me of m133 in the Chaconne. At m229, it is absolutely sorrowful, to my ears. Also, the end of the book is such a frenzy, as is the end of the Chaconne. It all made me wonder, is the structure of your novel based at all on the Chaconne? Did the Chaconne somehow inspire your book? How did you come to have such a special relationship with this piece? Gene: Thank you, Laurie, for your heartfelt reaction to my recording. Yes, I think of that pedal tone starting at bar 229 as the most sorrowful part of the piece. I had not consciously based the structure of my novel on the Chaconne. In a general sense, most of our great music in the Western tradition is compelling partly because of its structural integrity and cohesion. That has inspired me, both as a performer and now in my attempt to create something new. I do feel that I have a special relationship with the Chaconne, which I have played pretty often since I was 19, probably more often than any of the other Bach works. Sometimes I've had to pick it up on a day's or even an hour's notice, when someone is sick or delayed and we try to offer some kind of substitute program for a scheduled quartet concert. Like the C Major Fugue, the Chaconne seems bigger than the medium for which it was written, which is a wonderful challenge for the performer, and it has equal philosophical depth, and greater spiritual and emotional dimensions than the Fugue. But the sense of architecture and sonic scale in that Fugue are also wonderful. Laurie: Why did you tell this story from the vantage of a passive Aryan? Gene: Most Holocaust literature, both historical and fictional, has focused on the victims and the perpetrators. In "The Savior," I've tried to focus on someone caught in the middle, an imaginary witness to the horrors. We have all become such witnesses, having learned what we know about the Holocaust, and nowadays, with the lightning-fast news cycle, we are all witnesses to some extent to the tragedies in Darfur, Iraq and so many other parts of the world. Gottfried's passivity is meant to represent the passivity of those German people who were neither Nazis nor Resistance fighters. Gene: Though it's not my original title, "The Savior" seems to capture the irony of Keller's situation. He hopes against his better judgment that through his music, he'll be able to save a handful of victims. He and Rudi both identify with Judas Iscariot and his betrayal of the Savior; the question for those two characters at the end of the story is whether or not they are beyond redemption. Laurie: What are your latest projects with the Emerson String Quartet? Gene: We've just completed an 8-concert "Perspectives Series" at Carnegie Hall, featuring both the complete Beethoven cycle and a lot of other music. For our 30th anniversary season, we've released a 2-CD set of the three Brahms String Quartets and the Piano Quintet with Leon Fleisher. Our next recording project is a set of transcriptions of 4-voice fugues from the Well-Tempered Clavier. Our CD of the Art of the Fugue seemed to inspire a lot of interest among listeners. Laurie: Do you plan to write more novels? Gene: I hope to write more fiction, but have not yet settled on a specific idea. As promised, pictures from Yosemite! I'd never been to Yosemite, which is a major National Park in California that has some really, really big rocks and really, really big trees. Driving to the Yosemite Valley involves a lot of twists and turns and children saying, "Mommy, I f-f-feel sick, I think I'm gonna..." Fortunately, no one lost their breakfast. As soon as one goes through the tunnel into the valley, an amazing view appears, and that's where we took a little family picture. Actually, a complete stranger took the picture. What's great about Yosemite is that it attracts all kinds of professional and amateur photographers, so this guy got us from three different angles and really tried to capture what he could. Once in the park, we hiked several miles up to Vernal Falls, where I handed the camera to my seven-year-old son, who took yet another portrait that I'll call: "Mom in yellow hat, with unprepared smile." I was fine until the hike down, when I had the acrophobic experience of actually looking down (and climbing down!) the rather long, steep set of rock "steps" we'd so easily scrambled up. I took the picture of the 80-year-old Ahwahnee Hotel, with the great big rock wall in the background. It is very fancy and costs $a-zillion to stay there. It is NOT where we stayed. We stayed outside the park, thus the winding road. I'd never seen a giant sequoia tree -- these are up to 3,000-year-old trees, and the tallest one at Yosemite is about 290 feet, or 88 meters, high. It's really hard to catch the scale of these in a picture, but you can kind of tell, with us standing by the fallen tree, that they are really huge. The best picture I took, personally, was of my blue tin cup of chili at a "Cowboy Cookout" that we went on with the kids. We had something even better than an open bar: all the s'mores you can eat. A s'more is an American concoction that involves smashing a toasted marshmallow between two graham crackers, with some Hershey's chocolate in between. The chocolate melts, and the gooey combination is such a treat, you just want, well, s'more. These were double s'mores: two marshmallows, which we cooked on long wire skewers over a campfire, with six squares of Hershey's. My children ate an undisclosed amount, I had two, and Robert, showing a bit more restraint, had but one square of chocolate. So that's it, a little California dreamin' for your practice break!